Located in Santa Cruz County, Adam White, L.Ac, Dipl.Ac. is a licensed acupuncturist and herbalist with over 25 years of experience. My staff bills insurance and provides assistance with scheduling at our full service clinic. Fast, effective pain relief: musculoskeletal pain, arthritis, headaches, and more. 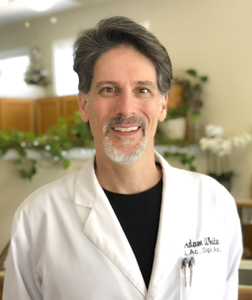 Learn more about Adam White, L.Ac., Dipl.Ac., licensed acupuncture and herbalist. Adam White, L.Ac., Dipl.Ac., M.T.C.M. received his Bachelor of Science degree from Northwestern University and his Master's degree in Traditional Chinese Medicine (M.T.C.M.) from Five Branches University where he has served as a faculty member and as an administrator. He studied Qi Gong at the Chang Ching Institute under the auspices of Professor Wae Shui. He is a Diplomate of Acupuncture and is a licensed acupuncturist and herbalist through the Medical Board of California. Adam White, L.Ac., Dipl.Ac., M.T.C.M. is the founder and CEO of the Healthcare Medicine Institute (HealthCMi). HealthCMi translates and publishes acupuncture CEU materials for licensed acupuncturists and is based in Santa Cruz. Adam White, L.Ac. remains committed to improving the health of every patient he treats. If a case is particularly rare and difficult, he takes the extra time and energy necessary to help his patients achieve optimum results. He is successful in the treatment of disorders such as acute and chronic pain, sinus congestion, allergies, interrupted sleep, headaches, carpal tunnel syndrome, and digestion disturbances. The joy of his practice is in the good health of his patients. Adam White, L.Ac. is successful in the treatment of musculoskeletal pain including lower back pain, sciatica, neck & shoulder pain, and knee pain. This includes arthritis, spinal stenosis, and disc protrusions & herniations. Adam White, L.Ac. treats sinusitis, allergies, sleep disorders, headaches and migraines, carpal tunnel syndrome, and digestion problems at his Acupuncture Santa Cruz of Capitola clinic. He is recognised for his treatments of lower abdominal pain associated with gynecological disorders including endometriosis, PMS, and uterine & ovarian fibroids and cysts. Adam White, L.Ac. also treats neurological disorders and autoimmune disorders including rheumatoid arthritis, Parkinston's disease, MS, post-stroke syndrome, sensory loss, and unregulated nerve pain (including myofascitis). 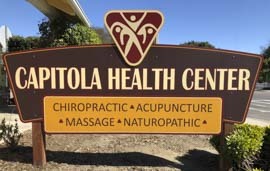 For over 25 years at my Capitola location, I have successfully treated back pain, insomnia, and digestion disorders such as diverticulitis, irritable bowel syndrome, and acid reflux. Patients with neck & back pain, shoulder pain, and knee pain enjoy the medical benefits of acupuncture at my clinic. In addition, acupuncture and herbal medicine is an effective tool for treating stress, fatigue, and depression. Acupuncture and herbal medicine are also beneficial for patients with allergic reactions and immune system disorders. Acupuncture treatments relieve the pain, improve range of motion, and restore the healing process to local tissues. In this way, peripheral nerve fibers have a chance to heal, disc protrusions shrink, tendons and muscles are relaxed and nourished, and inflammation diminishes. My goal is not only to stop the pain but also to restore your activity level so that you may enjoy a vibrant lifestyle without complication. For those going through menopause, protect your bone density with Chinese herbal medicine. The acupuncture and herbal medicine halt the night sweating, quell the mental restlessness, stop the hot flashes, and restore quality sleep. I use the same herbal medicine formulas that the great masters of Chinese medicine have used for nearly 1,000 years. Moreover, I use only the finest herbal ingredients. Infants, children, and adults have benefitted from acupuncture treatments at my office. Many patients are so relaxed during the acupuncture treatments that they fall asleep. Once the hair-thin needles are inserted, there is no sensation other than deep relaxation. This is because acupuncture stimulates parasympathetic nerve impulses and brain activity similar to those generated during sleep.